A few years ago, Adobe decided to rebrand Lightroom—its respected photo organizer and editor—as “Adobe Photoshop Lightroom.” To me, it seemed like a meaningless marketing exercise meant to bring Adobe’s new star application under a brand umbrella. I still think it was a questionable move, but beneath the branding is an important reality: Photoshop is really no longer a single application that runs on your computer. Adobe has made Photoshop’s core technology modular, such that it can be deployed in other areas and applications without reinventing it from scratch. “Photoshop” really is in Lightroom, and Photoshop Elements, and Lightroom mobile, and, now, the newest outpost of the empire, Adobe Photoshop Mix. 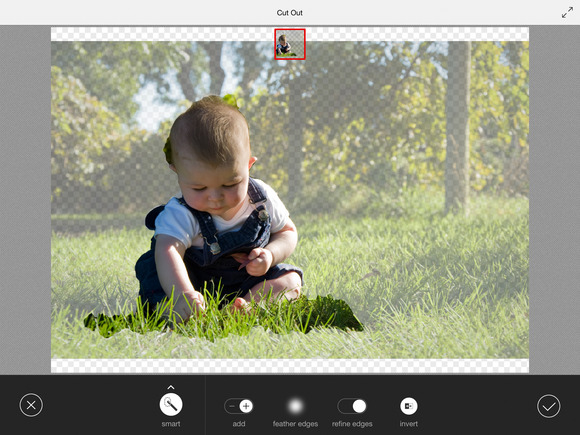 Mix is a free iPad app designed not only to perform photo adjustments (such as exposure or applying preset filters), but to also cut out portions of photos and combine them with other images. The app requires an Adobe ID, but no paid Creative Cloud subscription, and runs on the iPad Air and iPad mini with Retina display. Mix relies heavily on Creative Cloud, which is a nice bonus if you’d like a big library of images to work with. As you would expect, the app can access all the photos in your device’s Camera Roll, and there’s a built-in feature for taking a photo with the iPad within the app. If you have a Creative Cloud account, however, and you synchronize files to it, Mix can also open those images—not just JPEGs, but layered Photoshop files, too. Or, if you synchronize collections in Lightroom (to use with Lightroom mobile), Mix can access those photos, as well. Support for pulling photos you’ve shared on Facebook is also built in. Mix’s photo editing capabilities are surprisingly slim, perhaps owing to its primary focus on creating new compositions. You can crop and straighten images, and adjust exposure, contrast, clarity, and saturation (or tap the Enhance button to let the app figure out the adjustments for you). More focus is put on applying preset “looks,” an assortment of filters similar to those we’ve grown to expect from nearly every image-editing app. Mix rises above that convention, however, with the ability to easily paint chosen effects onto portions of an image. More of Photoshop’s underlying technology is apparent here: Dragging your finger over an image engages sophisticated selection technology for finding edges and manipulating them, and a Feather Edges tool softens hard edges and helps if you’re painting areas such as hair or grass. It makes working with a finger much easier on the iPad than if you were to use a stylus or mouse on the desktop. Adobe’s core Photoshop technology also exists in the cloud. Mix includes three advanced edit types—Upright, Shake Reduction, and Content-Aware Fill—that aren’t processed on the iPad itself. Instead, the app offloads the work to Adobe’s central server database. Remove items from a scene with help from the Creative Cloud. The flashiest feature in Mix—unsurprising, given its name—is its ability to cut out a portion of one photo and combine it with another using Adobe’s aforementioned selection technology. Drag to choose areas you want to keep; Mix’s Smart selection tool detects edges and builds a pretty accurate selection with minimal effort. After the image has been cut out, you can pinch to resize or rotate it, and drag to reposition it. Mix offers only two working layers, so don’t expect to build complicated collages, but simple compositions are quick and easy to create. Mix also works well as a first step in creating more complicated compositions on the desktop. When you’re done editing, you can save the image as a layered Photoshop file that’s stored in your Creative Cloud folder. Opening that file in Photoshop CC breaks down each Mix component as an individual layer, and the cut out portions as image masks that can be edited later (or discarded if you want to start over on the desktop). Mix looks to be yet another example of Adobe pushing to expand the technologies it developed for Photoshop into non-desktop areas like the cloud and, by extension, mobile devices like the iPad. I suspect that artists, designers, and hobbyists who like creating compositions or who want an image editor that ties directly into some of Photoshop’s editing tools and Creative Cloud are going to like Mix. A lot.